Enter personalization (if not quote) maximum 30 characters on rings. Contact me for longer text or personalization options. If you want a different font than lower cursive (as quote is in), please see photo for options and list with personalization. **This listing is for ONE BAND** Please see the quantity box for multiple rings. We have taken our most-loved quote from Joan of Arc and turned it into an oh so wearable inspiration. 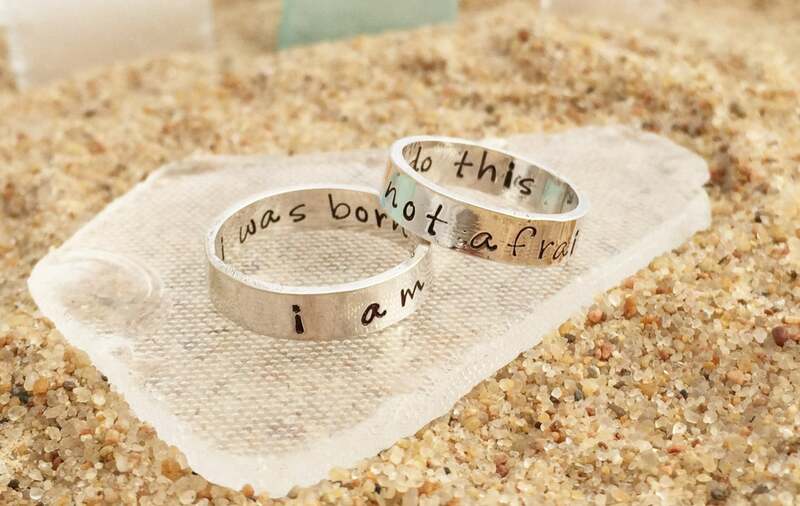 The exterior of the band is stamped "i am not afraid" and the inside is "i was born to do this." The ring is hand formed in sterling silver and each letter is hand stamped for a simple and elegant piece you can wear every day. The band is 4mm in width. The quote is stamped in lower cursive font. You can also personalized this ring with your own quote or names and dates. This ring will be custom made for you. Our average lead time is 2-4 weeks. If you need your item sooner, drop us a note and we will try to make it happen.